Hosted by Imagine the Universe! This poster is the third edition of Cosmic Times, with the publication date chosen to coincide with Einstein's death. By the mid-1950s a number of astronomers had worked on fundamental questions about the universe, and there was no clear answer which was correct. In addition, the size of the universe got bigger, and we started to explore the universe with more than just optical light. 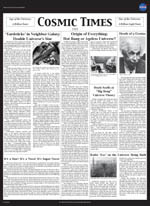 The year of this issue of the Cosmic Times was chosen to coincide with Einstein's passing. Much has happened since 1929, with the development of two competing theories about the nature of the universe, the discovery of supernovae, and a re-calibration of the Cepheids as standard candles. In addition, astronomers get their first "glimpse" of objects emitting in a region of the em spectrum other than optical light. Summary: Observations by Walter Baade, under dark skies offered by wartime blackouts in Los Angeles, lead to a new calibration of the Cepheids, resulting in new distances to far away galaxies. Origin of Everything: Hot Big Bang or Ageless Universe? Summary: The debate rages between two theories for the universe: Steady State vs Evolutionary. Summary: Ironically, the name "Big Bang" came from its biggest detractor! Summary: The world marks the passing of Albert Einstein. It's a Star! It's a Nova! It's Super-nova! Summary: Astronomers discover there are novae and supernovae, and that there are two types of supernovae. Summary: Radio astronomy was in its infancy and opening up a whole new set of objects not visible to optical telescopes. Astronomers were building the next big radio telescope. Overview: Students consider observations and inferences to determine the support for each of two theories on the origin of the univese. Overview: Students will play Jeopardy! based on the articles in the 1955 Cosmic Times. Overview: Students create a fictional narrative on the beginning of time. Overview: This lesson uses a simple discrepant event to demonstrate the underlying cause for early miscalculation of the size of the Milky Way galaxy. Overview: This lesson is an extension of the Cosmic Times 1929 lesson "Determining the Universe" to reproduce a plot of Hubble's Law. The language in the articles in the 1955 Cosmic Times mimics the style of writing that would have appeared in a real 1955 newspaper. While this is getting closer to more familiar language and sentence structure, it may still be a bit difficult for your students to read. As with other editions, we have provided three versions of the text in newletter form: an Early Edition aimed at 7-8 graders, a Home Edition aimed at 9-10 grades (with text from the online edition), and a Late Edition aimed at 11-12 grades (with the text from the poster). These, along with a glossary and questions for understanding are available above. The poster also shows a layout that mimics the papers of the time, however, we have taken some creative license to make it more readable in a classroom setting. Real newspapers of the time would have had 5-7 narrow columns of small type.